A strong characteristic of PDF/E is the inclusion of 3D engineering model data, as much 3D data is related in some way to engineering workflows. There are currently two distinct version levels of PDF/E. The first was the original specification, primarily aimed at 2D engineering drawing use cases, and is designated and published as PDF/E-1. In recent times as 3D PDF is becoming more widespread, the original specification is under revision to accommodate the changing conditions and also reflect the major new revision level of PDF 2.0. The new changes are not yet fully settled or published, but are currently known as PDF/E-2. PDF/E files preserve the visual representation of engineering data over time, independent of the tools and systems used for creating, storing or rendering the files. In this regard it shares some common goals with PDF/A for document archive. Rather than a single type, it has variations allowing it to address future workflow requirements. A prominent goal is to improve document exchange, collaboration, and print accuracy within engineering workflows, both inside companies and with extended enterprises of partners, suppliers, customers, government organisations, and private citizens. PDF/E enables organisations to streamline engineering workflows bringing together diverse sets of complex documents, resulting in improved productivity, collaboration and the ability to more quickly deliver better products to market. Over and above the base PDF standard, it defines the features of PDF that are required, recommended, restricted, or prohibited when creating, viewing, marking up, printing, analyzing, distributing and archiving engineering documents. It takes into consideration the differing needs of both interactive and non-interactive readers. ISO 24517 specifies the proper use of PDF for on-screen display and printing of engineering documents. Printed engineering documents are assemblies of a page (or pages) created by different organisations, which can be inter-departmental or inter-company. It also defines a framework for representing the logical structure and other semantic information of engineering documents within conforming files. ISO 24517 is intended to provide a format for the development of various applications, such as products that read, render, write, print, and validate conforming PDF documents. Different products will incorporate various capabilities to prepare, interpret, and process conforming objects. However, the inclusive, feature-rich nature of the format requires that additional constraints be placed on its use to make it suitable for engineering workflow documents. PDF/E allows engineering professionals to reliably create, exchange, and review engineering documentation, including large format documents. PDF/E enables organisations to work more effectively when creating or exchanging engineering documentation. There is no direct requirement for a PDF/E to have 3D content, in fact a major use-case is for 2D drawings replacing paper blueprints. 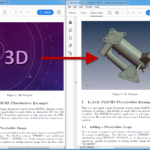 However, with the emergence of 3D technologies and the 3D PDF format, PDF/E is a natural home for discussing 3D PDF for engineering workflows. If a PDF/E document contains 3D, then by standards specification is contains either a U3D or PRC model data area. It is perfectly legitimate to create a 3D PDF document without reference to PDF/E. The PDF/E addition is a more specific subset aimed at a more restrictive archive and long-term use model. For daily and short-term ordinary PDF documents, 3D may be included and shared using both U3D and PRC encoding types. Some communities use “PDF/E” as a synonym for 3D PDF, but in fact they are distinct. Document metadata should include Author, Creation and Modified date, with all other document properties in XMP. Output Intent must be specified. Color Scheme Intent must be specified. Security should be disabled unless specifically in PDF/E-2s mode. More detailed information is expected to be available once PDF/E-2 has international approval and is published.